The kids were very quiet after breakfast this morning. Almost too quiet. In fact, so serene was my household that I actually enjoyed a second cup of coffee while it was hot. If I were a thinking person, I might have worried a bit. Luckily, the olders were using those incredibly creative minds of theirs to do sweet things. My Man B busied himself practicing piano (with headphones on! ), and writing thank you notes to our incredibly generous friends who gave him their keyboard, along with all the widgets, and whosits needed to make it play. 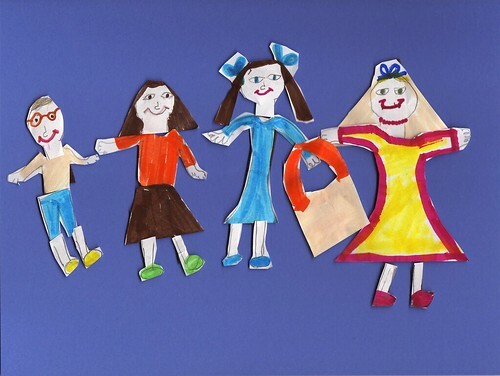 Miss M created this family of magnetic paper dolls. All of the parts are interchangeable, and she has plans to make accessories for them all — books, shoes, bags, ribbons. I had a roll of magnetic tape lying around which she cut sections off of to stick to the backs. Now we have a lovely, and ever-changing tableau on the fridge. Your children sound incredibly sweet! How would you like to exchange for a week??!! LOL! I love those dolls – SO creative! my daughter loves paper dolls, creating people, and magnets. We will have to try this. What a great idea!